The CPM, which provides crucial outside support to the UPA government, today accused the Centre of failing to protect the interests of farmers as also the country at the just concluded world trade talks and smelled “full-fledged scam” in the modernisation plan of airports in metros. The Allahabad High Court on Saturday decided to dismiss four and demote two judges of the lower judiciary, including two women. The move comes eights month after 28 judges were similarly removed. The NDA has conveyed to Prime Minister Manmohan Singh its decision to oppose the Constitution Amendment Bill providing reservation in private educational institutions but exempting minority institutions from its purview. India’s fourth generation communication satellite —INSAT-4A is going through the final phase of preparations before launch on December 22 in the European spaceport of Kourou in French Guyana, Indian Space Research Organisation officials disclosed here today. The Delhi Union of Journalists and other newspaper unions will observe a protest day tomorrow to express solidarity with the struggling workers in the newspaper industry. Both Houses of Parliament were adjourned for the day today without transacting any business as a mark of respect to Power Minister P.M. Sayeed who died of heart attack in Seoul yesterday. Poor response from the Congress-ruled states itself has left the agenda of Power Minister P M Sayeed in power sector reforms unfinished. Sayeed died of a heart attack yesterday. The Cabinet Committee on Securitys met this evening under the chairmanship of Prime Minister Manmohan Singh at his Race Course Road residence to hammer out a brief for the Foreign Secretary who leaves for a crucial visit to the United States tomorrow. Days after he broke the world record in ballooning, industrialist and aviator Vijaypat Singhania was today sworn in as Mumbai’s Sheriff. The deep depression in the Bay of Bengal that has developed into cyclone Mala is now moving north and lies 200 km east and south-east of Cuddalore district of Tamil Nadu. It is likely to hit tonight. The India-Pakistan technical talks on Sir Creek will be held here tomorrow to decide the terms of reference for a joint survey, the Ministry of External Affairs said tonight. The Indians will be led by Brig Girish Kumar, Deputy Surveyor-General, and the Pakistani side by Major-General Jameel ur-Rehman Afridi, Survey General. “The role of the government of India in these negotiations has not produced any outcome that adequately protects interests of farmers and the country,” CPM Politburo, the party’s highest policy making body, said in a statement on the Hong Kong Declaration. 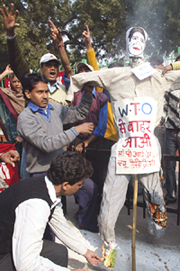 “The said declaration further reinforces the unequal trade regime and international economic order. The Government of India has failed to stand up firmly for a more equitable agreement both for India and developing countries,” it said. The party said the commitment of developed countries to eliminate export subsidies to agriculture products by 2013 was no achievement as they account only for 3.5 per cent of the total subsidies. “India will not be gaining much as its exports are limited. In the coming days, more pressure and trade distorting tactics are expected, which will adversely affect farmers and Indian agriculture,” it said. “Our primary interest should have been to ensure protection of small and marginal farmers. The special safeguard mechanism proposed will not be sufficient in the light of the fact that we have already agreed to further cuts in agricultural tariffs,” CPM added. On the airport modernisation issue, the party alleged there seemed to be a “full-fledged scam” in the bid process for the restructuring of Delhi and Mumbai airports. The party demanded scrapping of the entire exercise, handing over the modernisation work of these two airports to the Airports Authority of India and building greenfield airports at these metros. Addressing a press conference, CPM MPs Nilotpal Basu and Mohd Salim also charged the government with keeping Parliament in the dark on transferring Nagpur airport’s assets from the AAI to the Maharashtra Government at a token price of Re 1. Mr Basu said the government, in a written reply in Parliament recently, had stated that the transfer of Nagpur airport’s assets would be resolved through inter-governmental consultations, whereas the state government and the Civil Aviation Ministry had prepared an MoU for the transfer way back in August. They alleged this was done to compensate the state government for its decision to waive off stamp duty worth around Rs 250 crore for the Mumbai airport by transferring the assets of the Nagpur airport to it at a nominal price of Re 1. “The stamp duty waiver will only help the selected private party, which wins the bid for Mumbai airport,” they said. The two judges who were demoted are Jaiveer Singh and Syed Hussain. Interestingly, three of the dismissed judges had indulged in corrupt practices relating to cases of land acquisition, further strengthening the charge of the Opposition that a well-organised land mafia was active in the state. Criminal action is being initiated against former District Judge of Meerut P.N. Rai for fabricating and interpolating court records. The inquiry instituted to look into the matter in its report of 14 September had found him guilty of fraudulent practices in deciding land acquisition cases. The Bench has also questioned the role of President of the Meerut Bar Association Dheer Singh. They have asked the state bar council to look into the unscrupulous conduct of Mr Dheer as he reportedly connived with dismissed judge. The other two dismissed judges are Sanjay Kumar Goel, Special Judge, Mathura, and Sadhna Choudhury, Chairperson of the Administrative Tribunal (III) in Lucknow. Goel, who was earlier additional District Judge at Ghaziabad, is also the brother of a sitting judge at the Allahabad High Court. He was also dismissed following an inquiry that established his guilt while dealing cases of land acquisition. While the administrative committee of the high court presided over by Chief Justice A.N. Ray had only granted censure entry to Goel, the full Bench, on the basis of applications submitted by nine judges reconsidered the matter and decided to dismiss him. Like Goel, Sadhna Choudhury was also earlier posted in Ghaziabad as the second Additional District Judge. She, too, had been found indulging in unfair practices in cases relating to land acquisition. In case of Vinay Tamta, the other woman judge, the Bench decided not to extend her probation period. She was earlier Judicial Magistrate at Baghpat and is now posted in Allahabad. Similarly, in April this year the high court dismissed 28 judges who had reports of corruption against them or whose performance had not been found up to the mark. “The decision of the BJP and the NDA was conveyed to the Prime Minister by Leader of the Opposition L.K. Advani when the former telephoned him,” BJP spokesperson Vijay Kumar Malhotra said. Earlier, shedding their differences, NDA leaders at a meeting chaired by Mr Advani this morning, decided to oppose the Bill on the ground that it exempted minority institutions from its purview. The NDA’s view is that there should be reservation for Scheduled Castes, Scheduled Tribes and socially and educationally backward classes in government and non-governmental institutions, aided or unaided. “It should be applicable to all institutions and we have unanimously agreed that the clause exempting minority institutions should not be there,” Mr Malhotra said accusing the Congress-led UPA of playing politics on the issue by trying to portray the opposition as “villain”. “I would like to stress that the opposition is not against the Bill, but the clause in it that exempts minority institutions from the its purview,” he said. Demanding that there should be reservation for Dalits and Backward Classes among minority community in the minority institutions, the NDA leaders decided to move amendments to the Bill whenever it is introduced in Parliament. “Moreover, definition of minorities is not clear. There are institutions run by linguistic minorities where majority of the students are from majority linguistic community,” Mr Malhotra said. Key NDA ally JD(U) had reservations about the BJP’s opposition to the Bill as it did not want to be seen as adopting an anti-minority stance. The meeting chaired Mr L.K. Advani was attended among others by Mr Prabhunath Singh and Mr Digvijay Singh JD(U), Mr Braja Kishore Tripathy and Mr B.J. Panda (BJD) and Mr Dinesh Trivedi (Trinamool Congress), besides senior BJP leaders Mr Jaswant Singh, Mr Murli Manohar Joshi and Ms Sushma Swaraj. India’s fourth generation communication satellite —INSAT-4A is going through the final phase of preparations before launch on December 22 in the European spaceport of Kourou in French Guyana, Indian Space Research Organisation (ISRO) officials disclosed here today. INSAT -4A will have a co-passenger in MSG-2 of the European EUMETSAT, a meteorological satellite, and will be launched on board ARIANE-5, a generic rocket of the European Satellite Consortium— Arianespace. ISRO claimed the new satellite will cater to the emerging needs of Direct-to-Home (DTH) television services apart from 12C band transponders to augment its capacity for communication and DTH services. Tata Sky has signed an agreement with ISRO to lease all the 12 ku-band transponders to provide DTH transmission in India using VSATS. The space agency claimed as many as 12 channels can be beamed by using one Ku-band transponder. The satellite, which weighs 3.080 kg at lift off, is the heaviest satellite ever built by ISRO. The agency said it would take control of the satellite after lift off from the Master Control Room established at Hassan in Karnataka. The Master Control Room is expected to conduct operations to take the satellite into a Geosynchronous Transfer Orbit besides deploying solar arrays and antennae. The lift off of the satellite is likely to be covered live by Doordarshan at 04.03 am on December 22. Top ISRO officials, including its Chairman Dr G. Madhavan Nair and the Director of the Satellite Centre Dr K.N. Shankara are at present in Kourou where the final flight steps are being conducted. Officials said the telecommunication satellite had been built at a cost of Rs 300 crore and an additional launch cost of $ 50 million would be incurred to put it in space. The Delhi Union of Journalists (DUJ) and other newspaper unions will observe a protest day tomorrow to express solidarity with the struggling workers in the newspaper industry. In doing so, the DUJ has also responded to the Central Trade Unions call to hold an All-India protest rally to protest against the lowering of provident fund interest rate. Families of starving press workers will also join the rally, according to a press release issued by the DUJ here today. The decision to hold a protest and solidarity meeting was taken at an emergency meeting held here today by the DUJ President S.K. Pande, Hindustan Times Employees Union President, Anand Prakash, Patriot Union President, Rajkumar, Bennett Coleman Employees Union General Secretary Madan Singh and DUJ General Secretary Javed Faridi. In a statement issued here, the DUJ President said that an action committee on a common charter of demands was likely to be announced tomorrow. In the Lok Sabha, Speaker Somnath Chatterjee said Sayeed represented the Lakshadweep constituency from the fourth to 13th Lok Sabha and had risen to become the Deputy Speaker in the 12th and 13th Lok Sabha. Power Minister Sayeed will be given a state funeral in Lakshadweep — his native place — on Wednesday, as leaders of different political parties today paid rich tributes to the departed leader and recalled his contribution to Parliament and public life. An emergency meeting of the Union Cabinet, chaired by Prime Minister Manmohan Singh at Parliament House this morning, also passed a condolence resolution, expressing ‘’profound sorrow’’ over the death of Sayeed. The Cabinet decided to observe nationwide mourning today and give Sayeed a state funeral. Sayeed, an advocate, discharged functions of the Speaker following the death of GMC Balayogi till Manohar Joshi was elected to the post. During his almost four-decade-long stint in Parliament, Sayeed held various ministerial portfolios, including Steel, Coal, Mines, Home Affairs, Information and Broadcasting, and was currently the Power Minister, the Speaker said. He became the youngest member at 27 years to enter the Lok Sabha in 1967. As a linguist, Sayeed knew eight languages and was actively associated with several cultural and social organistions and worked for the promotion of folk art. He was also associated with the Central Haj Committee and the Advisory Board. The House stood in silence in memory of the departed. UPA Chairperson Sonia Gandhi, Leader of the House Pranab Mukherjee and Leader of the Opposition L.K. Advani were present. The House also paid homage to the 42 persons killed in the stampede in a flood-relief centre in Chennai yesterday. In the Rajya Sabha, Chairman Bhairon Singh Shekhawat described Sayeed as an eminent Parliamentarian and an able administrator. The Power Minister represented the NCT of Delhi in the House since August, 2004. The House observed a minute’s silence. Mr Sayeed also had to face the opposition of the Left Parties, which provide crucial support to the Congress-led UPA government at the Centre, over privatisation of State Electricity Boards and issue of free power supply to the agriculture sector. From the very beginning of his tenure, the officials in his ministry, and correspondents covering the power beat got an impression that Mr Sayeed was not at ease in the ministry, that demanded hard and controversial decisions—- unbundling of the state electricity boards, efforts to attract FDI in power sector, while dealing with state governments like Punjab and Andhra Pradesh that wanted to offer free electricity to farmers. At a time when the Left parties demanded to amend the Electricity Act to ensure state subsidy and abandoning of privatisation move, Mr Sayeed tried to walk a tight rope, by focussing on rural electrification in the name of “Rajiv Gandhi” and leaving states to offer budgetary support. In one of the interviews, this correspondent was surprised when Mr Sayeed asked his ecretary to answer the questions on his behalf in writing. Whenever, he would call a press conference, the correspondents would ask him such questions, that the conference would end in negative stories. But it is to his credit, that he would never be angry with his officials or the correspondents. He was quite popular in the Parliament as well. Whether it was the coal shortage for thermal plants or clearance of hydel power projects by the Environment and Forest Ministry, Mr Sayeed found it better to keep silent, instead of coordinating with other ministries. The Planning Commission also expressed its unhappiness from time to time over the failure of the Power Ministry to push forward the reforms- especially in generation and distribution sector. His critics point out when the Civil Aviation, Tourism and even Railway ministries succeeded in pushing the reforms; Mr Sayeed’s disappointing performance would badly affect the growth rate. Since Prime Minister Manmohan Singh will now take charge of the power ministry until a replacement is found, it is hoped that UPA government will be able to put the power reforms on path. The Cabinet Committee on Security (CCS) met this evening under the chairmanship of Prime Minister Manmohan Singh at his Race Course Road residence to hammer out a brief for the Foreign Secretary who leaves for a crucial visit to the United States tomorrow. The CCS and the Prime Minister were updated about the ongoing exercise of separating nuclear facilities in civil and military sectors. New Delhi is attaching a lot of importance to the visit of the Foreign Secretary as there is no regular External Affairs Minister. The sensitive issue of separation of civil and military nuclear facilities will be the focus of Mr Shyam Saran's talks in Washington. The Bush administration is keen, as articulated by Mr Richard Lugar, Chairman of the Senate Committee on Foreign Affairs, that India take a maximalist position on the separation exercise. On the other hand, the UPA government is under pressure from its allies to take a minimalist stand on the matter. The Foreign Secretary will be accompanied by senior officials of Department of Atomic Energy during his US visit. Maharashtra Governor S.M. Krishna administered the oath of office to Singhania at the Darbar Hall of the Raj Bhavan here. Several prominent Mumbaiites have been appointed to this ornamental post in the past. Past sheriffs include Bakul Patel (1992), cricketer Sunil Gavaskar (1995), actor Dilip Kumar (1980), actor-politician Sunil Dutt (1982), social activist Nana Chudasama (1989), businessman F.T. Khorakiwala (1993), actress Usha Kiron (1997) and filmmaker Kiran Shantaram (2002-2003). The Sheriff holds office for one year and enjoys the same protocol as the Mayor. The Sheriff presides over various city-related functions and is among those who receives prominent foreign guests. According to a weather office forecast, it is likely to move further north and hit somewhere between north Tamil Nadu in Cuddalore and Nellore in Andhra Pradesh tonight. Strong winds and heavy rain made life uneasy for residents in the state capital. There is a forecast of heavy to very heavy rain in Tamil Nadu and Pondicherry in the next two days and the authorities have taken all precautionary measures. A cyclone alert has been sounded in Cuddalore and neighbouring districts.